As part of your Aurora Fall Pond Closing, we recommend that you trim back hardy marginal aquatic plants to 2″ above the water to keep the dead foliage from drooping over into the pond. When you trim your aquatic plants, trim back waterlily leaves and stems to 2-3″ above the base of the plant. Doing so will help keep dead foliage from decomposing in the pond. Don’t bring waterlilies indoors, as they need a period of dormancy. If you left hardy waterlilies in their pot, drop them into the deepest part of the pond to over-winter. You don’t need to remove every single last leaf, but try to remove the majority. Decaying leaves and foliage produce toxic gases that can harm your fish so you want to remove this debris before winter rolls into town. After the first frost, stop fertilizing your aquatic plants. Bring tropical waterlilies indoors if you want to over-winter them. Keep the pot in 50-degree water or take them out of the pot and store in sand. Be advised, even trained horticulturists lose a lot of tropical waterlilies when storing them indoors, so you might simply want to treat them as annuals. 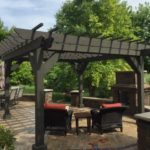 If you put Protective Pond Netting over your pond as part of your Aurora Fall Pond Closing before the leaves started to fall, your job is easy. Carefully roll up the net and discard the leaves that were caught. Check your skimmer basket and remove any leaves that are still caught inside. If you didn’t use a net over the surface of your pond, you’ll need to remove the build-up of leaves from the bottom of the pond. Use a long handled pond net to scoop them out. 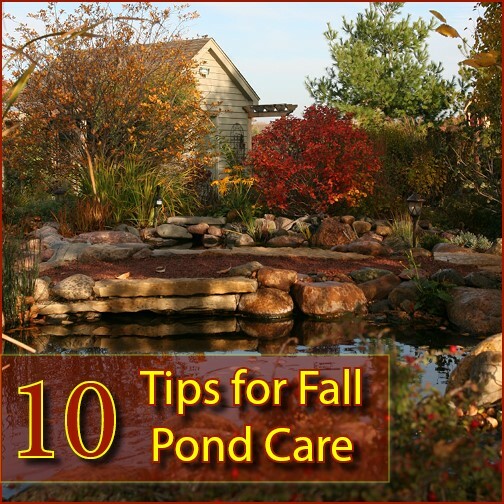 Add Cold Water Beneficial Bacteria to the pond once the temperature drops below 50 degrees. Use twice weekly for two weeks, and then once per week until the water starts to freeze. Once temperatures drop to 50 degrees, stop feeding your fish. They need to get ready to hibernate and you’ll want to avoid any metabolic complications. You can feed them Cold Water Fish Food until the temperature drops below 50 degrees. Contact BLC Yardworks with any questions or to get assistance with your own Aurora Fall Pond Closing.